NARS Persia (1), NARS Coconut Grove (2), MAC Saddle (3), NARS Portobello (4), Milani Blush Corallina (5), UD Mainline eyeliner (6), Burberry Redwood (7), Chanel Saaga (8), NARS Concealer stick - Biscuit (9), NARS Radiant Creamy Concealer - Caramel (10), NARS Tinted Moisturizer - St. Moritz (11), Chanel Perfection Lumiere Velvet (12), Chanel Vitalumiere Powder Foundation (13), UD Primer Potion (14), Avon Chocolate Sensation Quad - brow filler - dark brown shade (16), Chanel Les Beiges Powder (17), Maybelline Megaplush mascara (19). 1. Prime eyelids and apply a matte brown eyeshadow all over the lid. I used a color that's close to my skintone - NARS Portobello. 2. 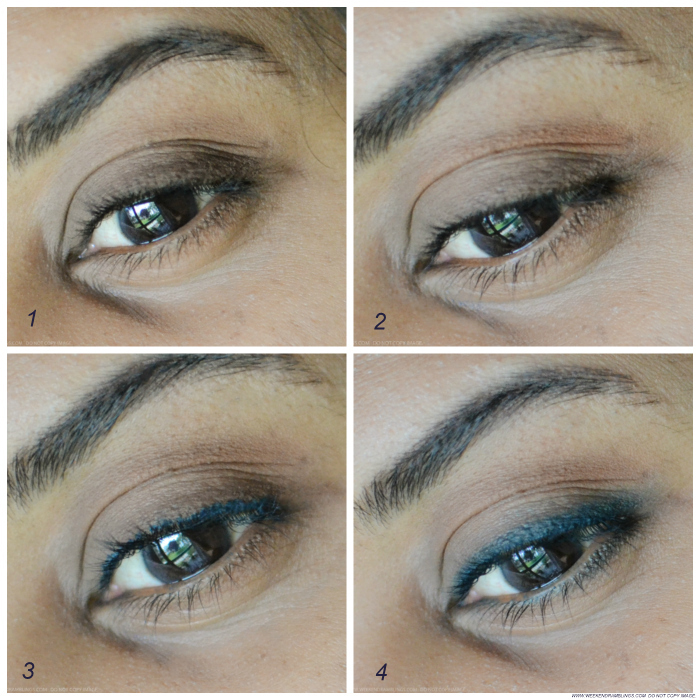 Blend a warm brown eyeshadow through the crease - I have used MAC Saddle. 3. Using a dark bluish green liner (UD Mainline - MAC Siahi would work great too), dot eyeliner along the roots of the upper lashes, keeping more of the color to wards the outer corner. 4. 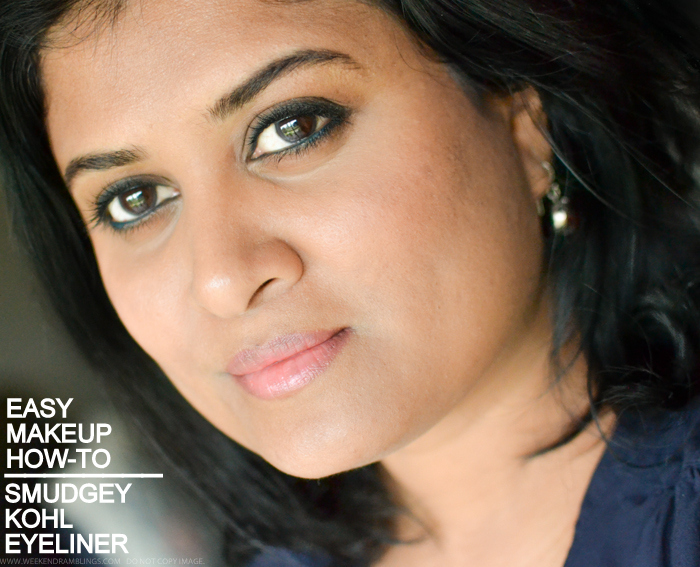 Blend the eyeliner using a smudger/pencil brush to give a soft haze of color along the lashline. Since I applied more eyeliner along the outer half, the smudged line is thicker towards the outer corner of the eye. 4. Using a thin angled brush, place a dark brown/black eyeshadow along the roots of the upper lashes - push the shadow along the lashline in a stamping motion rather than drawing a line. Also apply the same dark brown shadow along the outer corner of the lower lashline. 2. 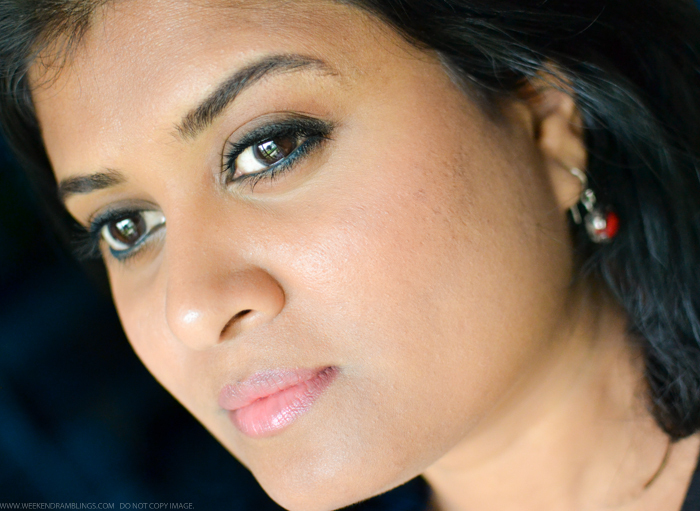 Smudge the shadow softly over the eyeliner along the upper lashline. 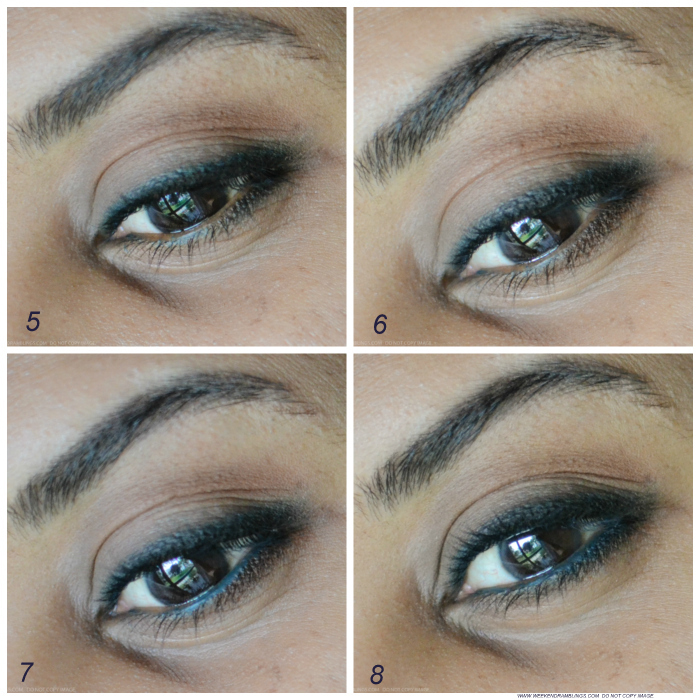 Use a warm brown/rust eyeshadow to blend the shadow along the lower lashline. 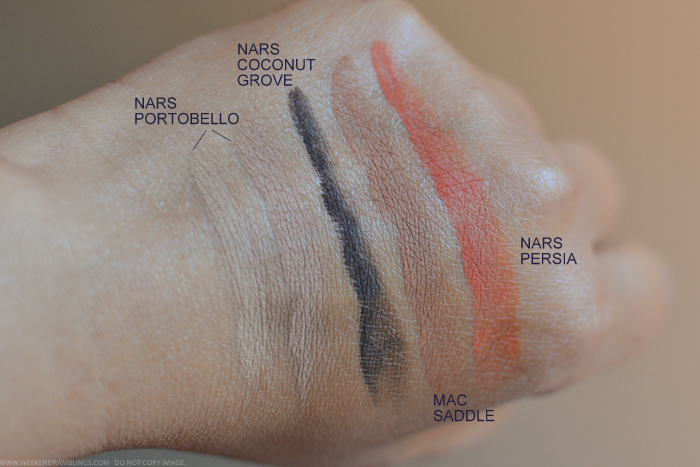 I used NARS Persia but MAC Saddle would work just fine. The color doesn't show up but keeps the lower lashline from looking ashy. 7. Tightline using the bluish green eyeliner, running the pencil along both the upper and lower lashline. I applied the eyeliner a bit messily along the lower lashline - more along the outer corner - and smudged the color into the previously applied brown eyeshadow. 8. Finish with black mascara. For the rest of my face makeup, I used a mix of Chanel Perfection Lumiere Velvet and NARS Tinted Moisturizer for my foundation, followed by NARS Radiant Creamy Concealer in Caramel mixed with NARS concealer in Biscuit for blemishes and dark circles. The blush is my new Milani blush in Corallina. 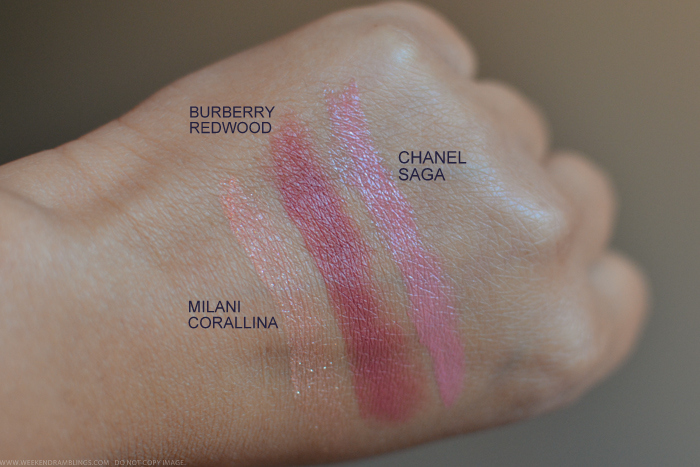 I wanted to keep the lips fairly neutral and used Burberry Redwood topped with Chanel Saga. I was a bit hesitant about trying out a dark liner, but this makeup did last well through the day (though most of my time was spent indoors). 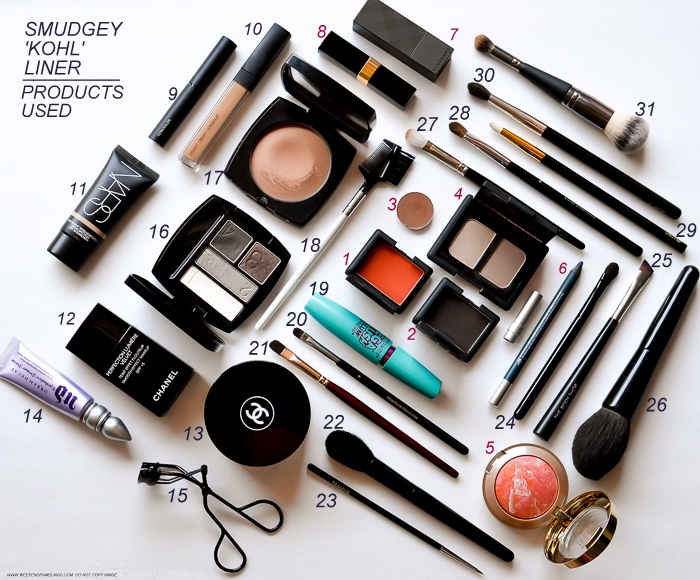 Looks like I found a new go-to makeup look for the weekend dinner - if only finding something to wear was this easy! 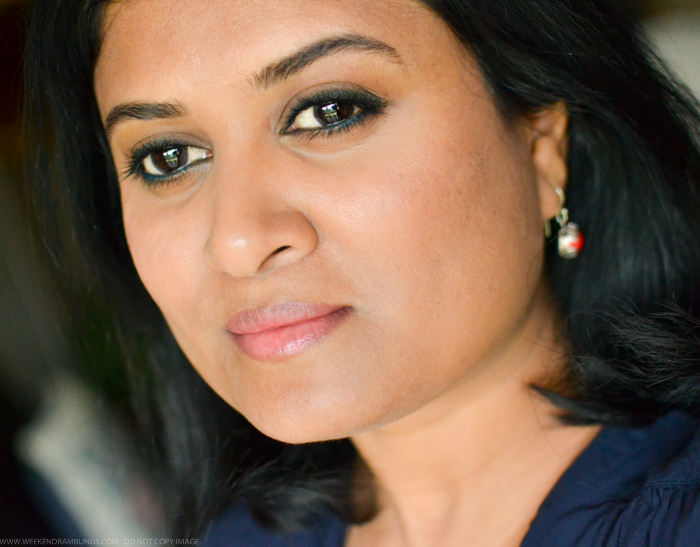 Hi Rashmi..your comment seems to have disappeared before I could get around to replying...but anyway from what I remember you had mentioned MAC Red Brick and Persua. I think the two are pretty similar and most people wont need both, but I think you would like Persia. It is a beautiful color and definitely one of my favorites. I was just watching a song from Piku on Youtube and thinking she looked fabulous! The eye look is exactly like hers and looks so good on you! I can't seem to get away with very dark liner as it accentuates my already bad dark circles. I have Redwood and haven't used it in a while - combining it with a lighter sheer pink is such a nice idea!